Spice up your wedding invitation envelopes with custom stamps that match the wedding invitation designs! 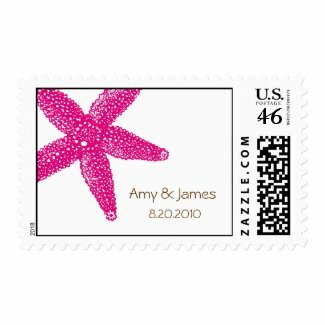 We have an entire series of starfish wedding stamps you can customize on our zazzle shop. These go perfectly with our Seashell Medley Wedding Invitations, Starfish Gate Fold Wedding Invitations and Starfish Pocket Fold Wedding Invitations. Posted in Designs, Tropical & Beach. Tagged with beach, destination wedding, envelopes, stamps, starfish, summer, tropical, wedding.